If you would like to see the News item. as the local news is only available for 24 hours on the i-player thing. Package about Dawlish starts about 3:40 into the broadcast. WP. Converting back to 7 foot gauge? It's the new one fathom gauge. I actually heard someone suggest to his partner that it might be for third rail electrification. I was wondering of those rails had been pre-painted to ward off the suns rays - but I've found a better explanation for that silver-grey colour. 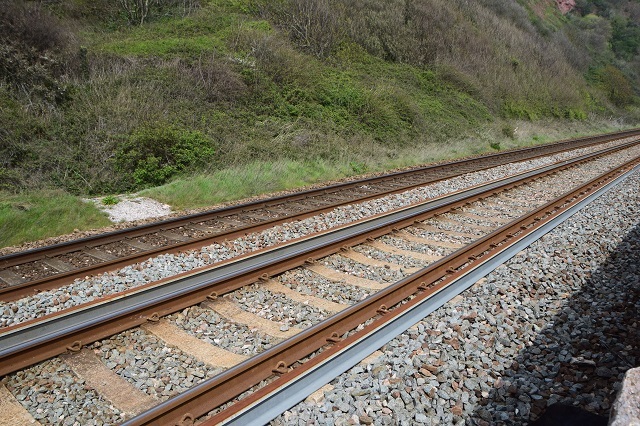 British Steel do a zinc alloy coating called Zinoco, marketed as protecting rails against corrosion in harsh environments like coasts (and using pictures of you-know-where).